This past week at Collins Street, we said a final farewell to our dear friend Ron Ham. The funeral service was a celebration of his life and ministry. There are many people who have requested the reflection on his life that my colleague Carolyn Francis and I offered. It is here for those interested. Ronald Norman Ham was born the 20th April 1929 in the Melbourne suburb of Balwyn and spent his early years in neighbouring Surrey Hills. He was the second of five children born to his parents Norman and Lila. Ron’s sister Hazel is with us today while his older brother Jack and younger sister Margaret are now gone. Another brother, Keith, died just after his third birthday. Ron was born in the first year of the Great Depression. Though his father was employed at minimum wage, there were years when he was forced to take a week’s leave without pay each month. Money was desperately tight, as this is the way it would be in Ham household for many years. To assist, Ron and Jack would routinely load up their billy carts with newspapers and take them to the local butcher’s shop to trade for a single shilling. The children attended the Chatham State School and on Sundays were regular Sunday School attenders at the Balwyn Baptist Church. Ron’s parents had married in the church, though they were not regular attenders themselves. His father was a committed member of the Independent Order of Rechabites, a friendly society that provided his parents a strong sense of community through to their later years. His father was promoted to become the State High Chief Ruler of the Rechabite Lodge. In 1941 Ron began his secondary education at Box Hill Boy’s High School, but at fifteen his schooling came to an abrupt end when his parents could simply no longer afford to support any further education. At the end of year 9, Ron took up a position as an office boy for the Royal Insurance Company here on Collins Street. His successful completion of the Public Service Examination allowed him to move to permanent employment as a telegram boy. Within weeks he was promoted to office assistant for the Postmaster General, Senator Donald Cameron who was in the cabinet of the Chifley Labour Government. It was during these years that he learned a great deal about politics and was swept up in the euphoria of the war’s end. During these years Ron continued to attend the Balwyn Baptist Church and was an active member of its youth fellowship. It was here he began to sense God’s calling upon his life. He was deeply impacted by the preaching of ministers Gordon Carr and EC Watson who, he often said, though fundamentalist in their theology, opened up to Bible to him in life changing ways. He also read avidly, biographies of great missionaries like Hudson Taylor and William Carey. Their stories inspired a deep commitment to the mission of the Church. When he shared this growing commitment with his parents, his mother was unimpressed, horrified that he would give up a secure position in the public service for some sort of religious calling. His father, on the other hand, confided in him privately that he had his full support. He resigned from the public service. His first task was to complete his matriculation. He did this at night school while working by day as a clerk with a local transport company. Ron’s application to join the Australian Baptist Missionary Society was stalled due to his family history of tuberculosis. He was redirected into ordination for the Baptist ministry. With his application for theological studies lodged, the 21-year-old Ron was required to serve as pastor of a small country church, in his case the Black Hill Baptist Church in Ballarat. The presumption was, Ron said, that if both he and the church survived, he might just have what it takes to become a Baptist minister. It turned out, as we all know, that he did. A year later he was admitted to the Baptist Theological College of Victoria in Errol Street, North Melbourne. It was 1953 and Ron was one of just three students in his year. His friend David Griffiths was one of them. Alex Kenworthy and Peter Stockman were just ahead of him. This foursome became a sustaining support in all the years of Ron’s ministry. Until Alex’s death in 1994, these friends had lunch together every month. The remaining three have continued the tradition ever since. He would later write of these times, ‘There is a wonderful liberty in our meetings because we trust each other and keep each other sharp on matters theological and ecclesiastical, as well as on current affairs.’ It was during his studies that Ron served student pastorates at the Aberfeldie, Oak Park and Abbottsford churches. In 1955 Ron finished completed his Licentiate in Theology and immediately began a Bachelor of Arts at the University of Melbourne. It was in his first year of this degree that he met an American Fullbright Scholar in residence at Janet Clark Hall. She was a Baptist from Missouri and inspired him with stories of the Baptist Student Union there. Upon her return to the US she arranged for a scholarship for an Australian student to spend a year with the BSU in Warrensburg, Missouri. Ron applied. Meanwhile, in 1957, he was ordained to the Baptist ministry here at Collins Street, and moved immediately to take his first formal pastoral appointment to the Kyabram Baptist Church. It was while he was at Kyabram that he was awarded the Clifford Scholarship. After one year at Kyabram he set sail for the US. A year later, back in Australia, Ron took up his second pastorate at Aberfeldie. It was 1959. Many good things happened at Aberfeldie. Most importantly, it was here he met Janice Pumpa, a girl from Portland who was in Melbourne to study education. He fell in love. It was a tortuous process for Ron, struggling to understand the will of God for his life. Jan was good humoured enough to let him struggle. It was in 1962 that Ron finally found the courage to propose. The complicating factor was Ron has already committed to returning to the United States to continue his studies. What’s more, in order to fulfill her obligations to the education department, Jan had a year of teaching to do in rural Edenhope. Though technically, they married the day Ron set sail for the US, it was year later their married life began when Jan joined her husband in Los Angeles. Transferring his academic credits from Melbourne, Ron completed his BA with a further two years of study at William Jewell College at the edge of Kansas City. From there Ron and Jan moved to New York where Ron continued with his Masters degree at the prestigious Union Theological Seminary. Their time in New York was deeply formative. The Vietnam War was in full swing, Americans were still reeling from the assassination of Kennedy and the fight against in apartheid in South Africa was building internationally. Before this time Ron had already developed a deep and considered theology of pastoral leadership. His commitments to preaching, thoughtful liturgy and prayer, and the pastoral care of God’s people were commitments that would all colour his work. But it was in New York that he began to have a stronger sense of the political implications of the Gospel. Profoundly challenged by the role he saw Christian leaders play in the civil rights movement, and the campaign to end apartheid, Ron began to broaden his understanding of the vocation of pastoral leadership. The seeds sown during this extraordinary period in his life, and the world, would alter the future contributions he would make. By the time he returned to Melbourne to take up the pastorate of the Ashburton church in 1966, he had a much stronger sense of the prophetic role of the minister. Ron and Jan were at Ashburton for six and a half years. And they were good years: some of the best he would later say. It was here that Lisa was born in January of 1967 and Anthony in 1970. ‘Jan still reminds me,’ he would later write in regard to Lisa’s birth, ‘that on the evening on which she had her labour pains, as we were about to leave for the hospital at 10pm, I put on a tie before driving off!’ It was during these years that Ron served as Secretary of the Baptist Minister’s Fraternal and was a member of the Executives of the Baptist Union of Victoria and of the Baptist Missionary Society. He taught both New Testament Greek and New Testament Backgrounds at the Theological College. The present Principal Frank Rees recalls these classes warmly as among his first. Ron was also an active leader in the Ecumenical Council of the churches. In 1973 Ron accepted a call to Central Baptist Church in Sydney. It was a difficult decision, and one he sometimes reflected upon with uncertainty. What would his family life have been like, he wondered, had he chosen to stay on at Ashburton? Regardless, he was there until 1976 when he accepted an appointment to the faculty of the Theological College of NSW as Lecturer in Systematic Theology. The current Principal of what we know today as Morling College, Ross Clifford, did his first classes in theology with Ron and recalls a gracious man of God. Of course, these were tumultuous days in theological education, especially among the Baptists. Arguments raged over orthodoxy and the inerrancy of Scripture. Jan recalls attending a state Baptist assembly at which the most atrocious accusations were made against the teaching faculty, her husband included. It was the last assembly she would ever attend. In 1981, Ron accepted a call to return to Melbourne as the first Australian born minister of the Collins Street Baptist Church, the oldest continuing Baptist Church in the nation. He was here for 13 years. They were challenging days, but under his sensitive and courageous leadership, represented a very significant shift in the life of the church. It was Ron’s vision for the city and concerns for its most marginalized citizens that saw the beginnings of the Urban Mission Unit, later to become what we know as Urban Seed. It was not only his vision that impacted this church, but his deep pastoral concern. In the words of Peter Hearne, a long-time member of Collins Street, if previous pastors had been remote, Ron was imminent. No one who came into his presence left feeling anything but valued. It was also during this time that Ron served as President of the Whitley College Council, the college where his own theological formation had begun all those years before. He offered supervision to candidates for ordination and provided lecturers on preaching, literature and theology. In 1995, at 66 years of age and facing the first signs of the cancer that would eventually lead to his death some twenty years later, Ron retired. Of course, full retirement was not really Ron’s style, despite his health issues. He took up subsequent ministries with the Footscray and Ashburton churches, providing care and wisdom to these congregations and their leadership through challenging periods of their own. 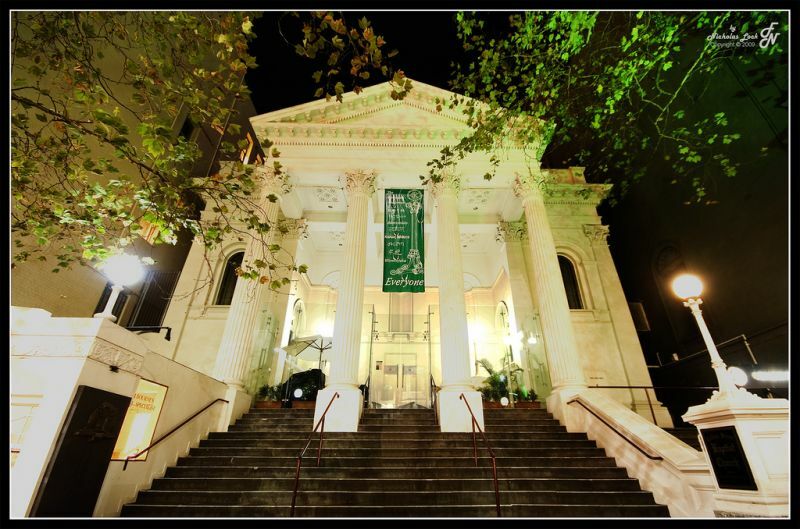 It was in 2010 that Ron finally did retire, returning to worship here at Collins Street for the last five years of his life. It will not surprise you to hear that Ron was quick and generous with his encouragement and affirmation of those of us leading and preaching in this church. After each sermon I preached Ron would, without exception, present himself to me to offer his thanks and insights. This was no simple “well done.” His words of gratitude always gave way quickly to the discussion he really wanted to have. Ron wanted to discuss the scriptures, which he loved, and the craft and vocation of preaching, which he believed in and revered more than anyone else I have known. Ron believed preaching could, and should, change people’s hearts and minds. Indeed, Ron believed preaching could, and should, transform the world. He believed that the gospel was genuinely good news, and that the scriptures ought to be proclaimed with passion and intelligence and insight. He did this for many years as a preacher himself, and he was delighted when others did it also. It is an extraordinary life that Ron has lived, but throughout it all he has consistently pointed us not to himself but to the God and the faith that so shaped him. As he said to me one day, sitting in his living room, ‘It’s not all about us, is it Simon?’ What is this God like to whom Ron so unfailingly deferred? The God Ron pointed us toward is a God of presence, with us deeply and profoundly in Jesus Christ. Ron’s ability to be with us in our deepest pain and dark nights was a reflection of the God he believed in. This God is a God of embrace and inclusion. We were never judged in Ron’s presence, yet prodded gently to be better people. His passionate belief in the wideness of God’s mercy and the radical inclusion of God’s grace got him into trouble with some who labeled him a liberal. But this commitment to inclusion and justice for all arose out of his own encounter with truth and his belief in the endless love of God. Just days before he died, Ron had requested that I bring communion. He could barely lift his head and had trouble swallowing, but this was important to him so we persisted. His voice had been reduced to a whisper. After sharing with him the elements of bread and wine I read to him Psalm 16, the psalm he had read to me just two weeks before. As I came to the final verse, he whispered along with me: ‘You show me the path of life. In your presence there is fullness of joy; in your right hand are pleasures forevermore.’ Indeed, may Ron now experience that joy in all its beauty, for we have known it in him. Amen. With that in mind, he suggested I take everything food-related from this blog and create a second blog geared around the subject area of my book ‘Eating Heaven’. That way, both blogs are clearer in what they want to do. Over there I prattle on about food and here about everything else. So, if you are into eating and obscure musings about all things food, you can go there. If not, you don’t have to suffer my culinary obsessions any longer. You can just drop by here!